White Balance is a setting on a digital camara that tells the camera sensor where to set the white point along a shifting color scale. This white point is defined by setting the camera at a point along the 'Kelvin Temperature' scale that is often shown as a range from 25K (2500 Kelvin) to 65K (6500 Kelvin) or higher on some cameras. Different lighting conditions such as indoor lamps and outdoor sunlight have varying colors that require the camera to be matched to them in order for colors to appear natural. When the white balance is set to a specific Kelvin, any lighitng sources that match that Kelvin temperature will appear to have the correct color hues within the camera image. White Balance is a setting on a digital camara that tells the camera where to set the white point in a shifting color scale. Different lighting conditions such as indoor lamps and outdoor sunlight have varying levels of color that require the camera to be matched to them in order for colors to appear correct. Color Temperature is a number that defines the range of color meaurement for artificial light sources and varying conditions of natural daylight. Color Temp is stated as a number within a range from about 1500 to 10,000 and is appended with the letter 'K' which stands for Kelvin. Color temperature settings in-camera will match the lighting sources used to the color temp being recorded. Color Temperatures of lighting fixtures and natural sources range in the warm hues of fire and candles from about 2000 Kelvin to 32K (3200 Kelvin) and are referred to as "indoor" lighting. 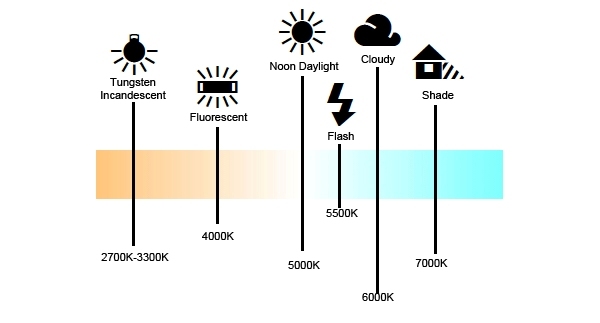 56K (5600 Kelvin) is referred to as "outdoor" light, matching the sun. The Kelvin Temerature scale is a numeric correlation of visually apparent warmth or coolness of a light source to a white point setting for a camera's image sensor. The most useful range in film making is from about '2900 degrees Kelvin' (29K) to about '7000 degrees Kelvin' (70K). The two most common standards are 32K for indoor and 55K for outdoor. Color Balance is a process of adjusting values of color as they relate to two directional sliding scales of Kelvin Temperature settings and Green/ Magenta shift within the image captured by a digital camera. Artificial ighting sources have kelvin temperature ranges generally ranging from 3200K to 5600K depending on lamp design. Shifts in color from artificial lighting can also occur along the green and magenta band of the light spectrum. Color Balance allows shifting along the two spcetrum planes.